Following Friday’s events, the attached image went viral. The figures (if correct) are certainly suggestive, but obviously, the population at risk varies widely between countries. What we need is the gun-related homicide rate for a sample of comparable countries. I headed over to the Brady Campaign, which had created the image, but could not easily find comparative data. Next, I tried the very useful Gun Policy Project. Their website features very detailed country profiles, but unfortunately no ready made tables, and so I spent a lazy hour keying in gun-related and total homicide numbers as well as possession rates (guns per 100 people) for 34 OECD countries. 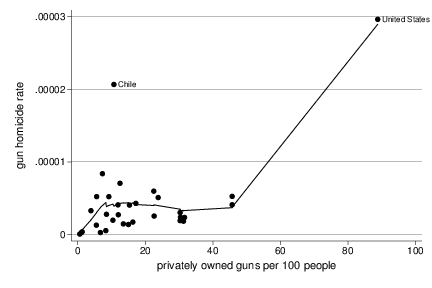 Looking at the data, I decided to remove Mexico from the sample: The civil war like situation in the North means that relatively few guns are enough to kill about 11,000 people each year in a population of just over 112 million people. Put differently, about one in 10,000 Mexicans is shot dead each year. Thankfully, no other OECD member is in a comparable predicament. 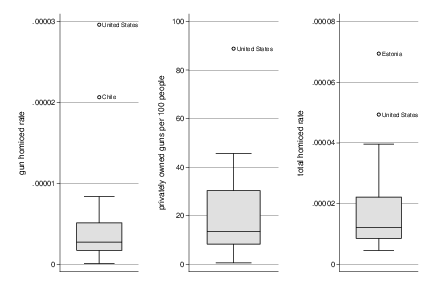 Next, I created boxplots for the distribution of possession rates, gun-related and total homicide rates. The US of A is clearly an outlier in every respect. I was somewhat surprised by Estonia’s high homicide rate. While the country’s population is small at 1.3 million people so that random fluctuation could have an impact, a rate that is roughly six times the median seems excessively high. 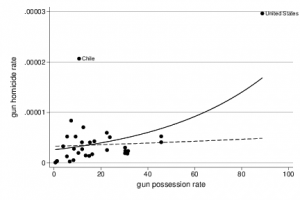 As expected, gun possession raises the risk of being shot dead significantly. 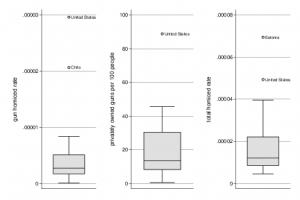 According to the model, each additional gun per 100 citizens increases the relative risk by exp(0.021) = two per cent (careful: If the initial risk is very low, that means that you are still quite safe). So what’s the implication for the US? 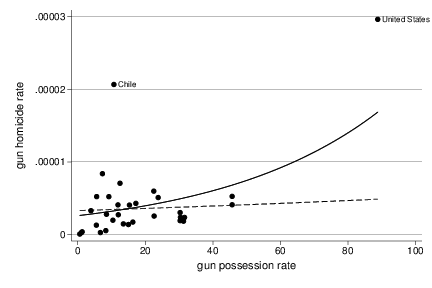 If the model was true and the US would bring down its possession ratio to the OECD median of 13.5 per 100 citizens, the model predicts 1071 gun homicides, as opposed to 9,146 actual cases (2009). That would be 8,075 lives saved. But the model does not fit very well, and we might be better off with a very naive, non-parametric estimate. If the US became less like the US and more like the rest of the OECD, its gun homicide rate might come down to the OECD median. That would amount to 846 people murdered using a gun, less than 10 per cent of the current figure. Of course, some of those people who would be spared the bullet might be killed by other means, but that is arguably more difficult. And this is just homicides. If you add manslaughter, suicides and accidents, it seems safe to assume that the NRA/Second Amendment culture costs at least 8,000 lives a year.